Photograph courtesy A Healey. 24066 at Doncaster Works on June 17th 1978. The fifteen year eight month career of 5066/24066 saw allocations to Eastern Region, London Midland Region & Scottish Region depots. Original exhaust port covered but not immediately removed. Battery Isolating Switch Cover modification (three circular flaps). November 1960 to Willesden (1A). August 1966 to Haymarket (64B). March 1968 to Eastfield (65A) on loan. November 1968 to Stoke Division (D05). July 1969 to Haymarket (64B) on loan, made permanent August 1969. February 1971 to Eastfield (65A). April 1971 to Haymarket (64B). August 1975 - to store. 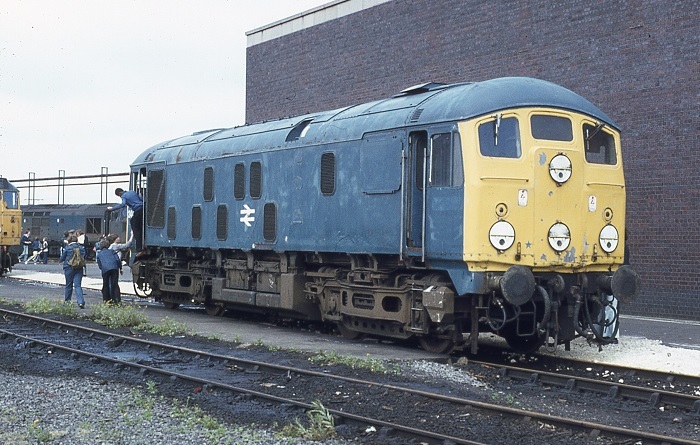 During August 1975 24066 was stored at Haymarket, during the same month it was moved to Carlisle and remained there until February 14th 1978 when it was moved to Doncaster Works, being noted by the Works headshunt on April 16th 1978. It was broken up during August 1978. Movement: 24019/66, 24102/121 07.00 Carlisle - Doncaster 9Z14 February 14th 1978. (25191 to Skipton, then 31183 to Doncaster). Photograph collection of webmaster. 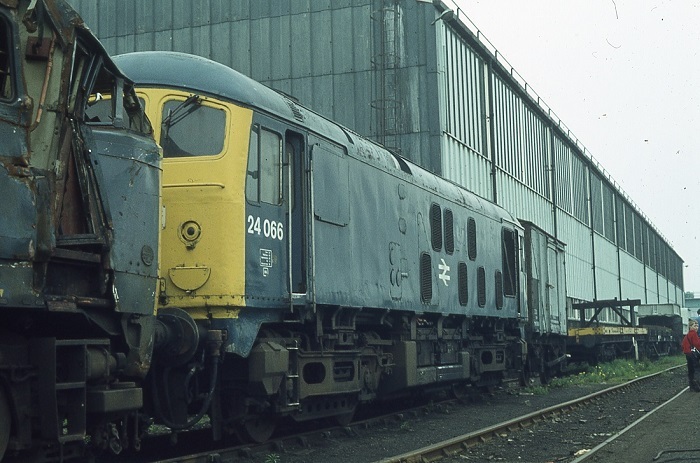 24066 awaiting scrapping at Doncaster Works during 1978. Of interest is the non-standard Battery Isolating Switch access, in place of the hinged flaps are three circular covers, which are pivoted from the top. Noted Doncaster Works November 1962. Noted Doncaster Works May 1963. Noted Doncaster Works May 1965. Noted Derby Works March, April & July 1966. Noted Glasgow Works August & September 1969. Noted Glasgow Works September 1973. Returning to Doncaster Works for scheduled repairs were Eastern Region members of the BR/Sulzer Type 2s, one of the first noted was D5066 seen in the Plant on December 9th. With Stratford targeted for closure their work would be partially picked up by Doncaster. Condition date uncertain: green livery, small yellow warning panels, curved upper corners, does not cover frame level stripe, small gap between the yellow paint & the stripe; full size water tank, shortened fuel tank, steam syle shed plate on cab front. Condition no month: green livery, small yellow warning panels, curved upper corners, does not cover frame level stripe, small gap between the yellow paint & the stripe; full size water tank, shortened fuel tank, steam syle shed plate on cab front (34G), ridge sided sandboxes, three-rung bogie mounted footsteps, two engine exhaust ports - circular port is covered. For the operating authorities troubles of a mundane nature were epitomized by D5066 in the middle of February. On 11th whilst working 07.06 Edinburgh - Carlisle it became a failure at Riccarton, rescue came in the shape of D8607, the Hawick pilot. Kingmoor successfully rectified the problem permitting continuation of its diagram, a round trip over the Waverley route, before again failing at Carlisle. A Kingmoor Class 5, 44677 substituted for the diesel’s workings the next day, with Kingmoor choosing to drag the diesel back to Haymarket behind 44902. This left them short of a machine for the same diagram of 14th, allowing Kingmoor Brittania 70024 to fill in the turn. Haymarket’s BR/Sulzer Type 2s continued to handle the majority of passenger workings over the Waverley Route, however on December 9th D5205 worked the 13.00 Carlisle – Edinburgh and the 17.54 return. On the 21st D5066 failed prior to working the 13.00 to Edinburgh but was able, after attention to take out the 17.25 parcels to Perth. Condition June: green livery, full yellow cabfronts, frame level stripe, gangway doors present, shortened fuel tank, full size water tank, steam syle shed plate on cab front (? ), ridge sided sandboxes, three-rung bogie mounted footsteps, blanking plates fitted, hand/footholds present. Scottish Type 2s were frequent visitors to Carlisle & Newcastle, though forays further south were unusual. However on September 20th the 4E47 Aberdeen - Kings Cross fish train was noted at Doncaster behind Haymarket based 5066. On a sunny June 6th 26017 & 24066 were noted passing Inverness with a trainload of pipes originating from the MK Shand pipe coating works at Invergordon, where pipes were coated with concrete for use in the Forties Field to the Cruden Bay oil pipeline. The trains went usually to Maud on the Fraserburgh line. 24066 was stabled at Aberdeen Ferryhill on June 20th. On July 16th 24066 was noted southbound(?) at Aviemore with a mixed freight. 24066 & 24070 were noted at Edinburgh Waverly on a parcels working on August 2nd. 24066 was withdrawn on February 2nd 1976. Condition final: blue/yellow livery, gangway doors sheeted over, headcode discs centered on cab front, shortened fuel tank, full size water tank, ridge sided sandboxes, three-rung bogie mounted footsteps, blanking plates fitted, hand/footholds plated over, non-standard battery isolating switch cover (three circular hinged discs). Page added June 7th 2016.